Editor’s note: This is the first part of an occasional series on kayak fitness. And thanks to Barbara Kossy for being our model for this post! 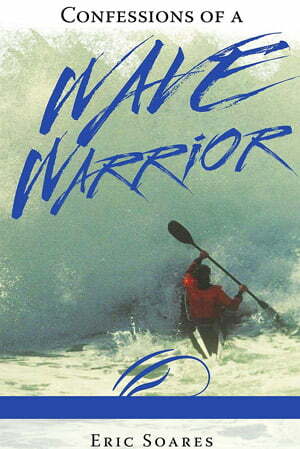 Fitness for kayakers is a hot topic. As we age it becomes quite important to spend some time keeping our bodies fit and prepared for activity with warm-ups and fitness regimes. 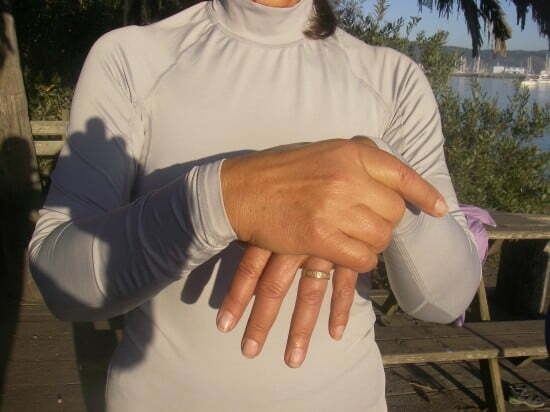 As a longtime fitness professional and sports enthusiast I’d like to offer some simple techniques for enhancing your experience on the water by warming up the wrists. 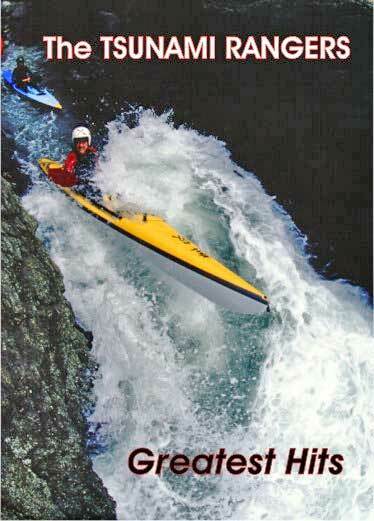 Wrists take a lot of beating in kayaking, especially if we’re guilty of performing the death grip on our paddles. 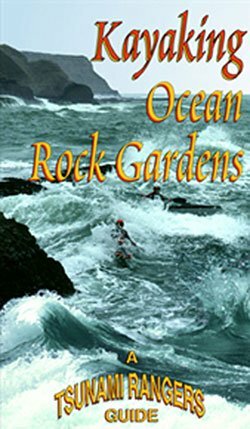 But even if our touch is light as that of the proverbial fairy, cold water and extended paddling can take their toll. 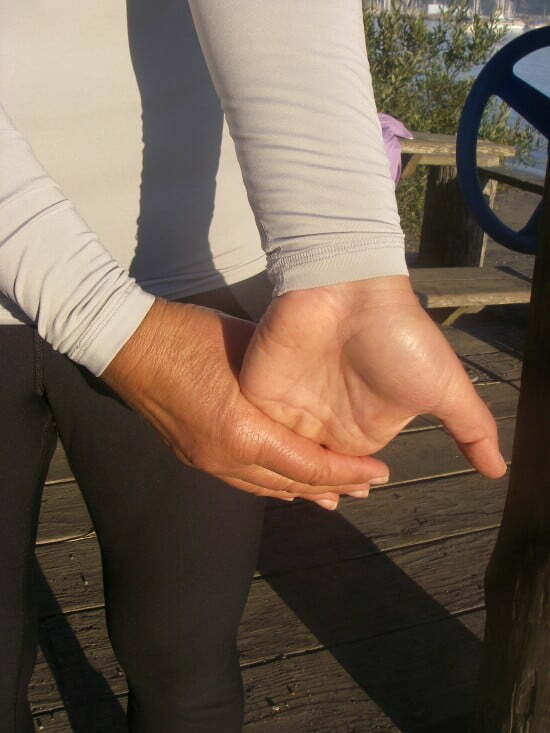 Here are five wrist stretches you can do before, during, and after your paddle. This stretch, as its name implies, comes from martial arts. Katate Tori Ichi means “single hand wrist hold one”. To perform this stretch, keep your upper body square. Take your left hand and hold it with your right, your right thumb on the back of your left hand and your second and third fingers on the base of your left thumb. You don’t need to use your forefinger or pinky finger for this stretch; in fact, you can get a better stretch if you don’t. Basically, you make what we call a “C-clamp” with your right thumb and two middle fingers. Using this C-clamp, hold your left hand close to your chest and twist it clockwise as far as it will go. Hold for a count of 10 – 20 seconds. The second stretch is another form of Katate Tori. 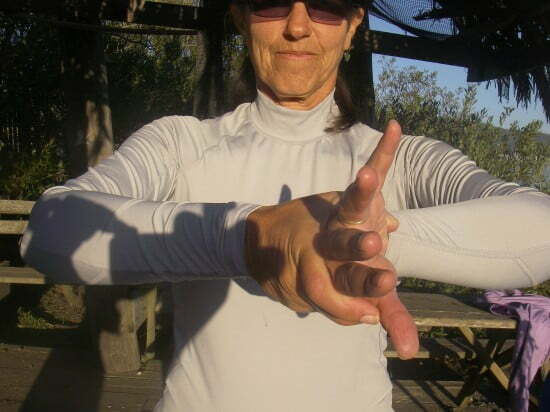 For this stretch turn your hand so that the fingers are pointing down. Using the same C-clamp grip as described above, hold your hand just below the wrist and press gently but firmly with the heel of your right palm against the back of your left hand, accentuating the flexion in the left wrist. 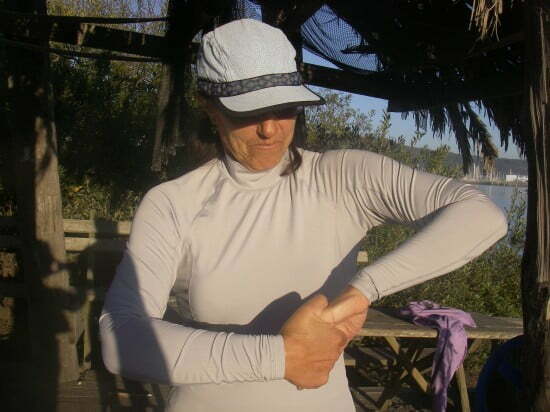 The third stretch can be performed by simply releasing your hand from Stretch Number 2 and turning the left wrist so that the fingers point up (more or less). Re-grip your hand with that C-clamp and using the clamp twist your left wrist so that the pinky finger is moving toward you and your fingers are turned upward. In the photo below you can see that Barbara’s fingers are pointing away from her. This is fine, but over time as her flexibility increases she should be able to rotate her wrist more so that her fingers are more vertical. 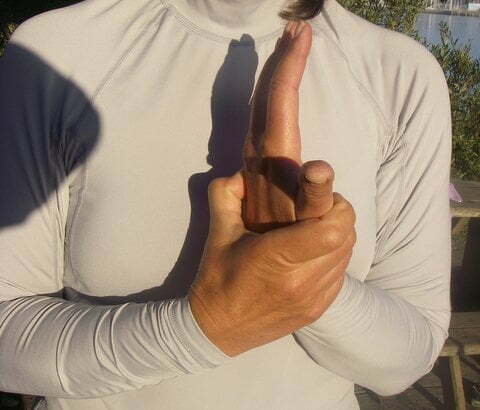 The fourth stretch in this sequence can be performed from the Number 3 position by turning the fingers down and re-gripping the left hand with the right palm against the left palm as though you’re shaking hands with yourself. Keep your left elbow high and use your right thumb to fold the left pinky back against the other fingers of the left hand. Twist your left wrist gently in a clockwise direction using your right hand. The fifth and last stretch is called Moro Yubi Tori (multiple finger hold). You’ve probably seen this one before. Grasp the fingers of your left hand between the fingers and thumb of your right. Straighten your arm so that your elbow is fully extended and gently but firmly bend your left fingers back. Be sure to grasp only the fingers. All of these stretches should be held for 10 – 20 seconds. Be sure to do both hands. I hope these techniques will be helpful. For myself, I do them several times a week, especially before and after martial arts practice, gardening, or kayaking. I find that the stretches keep my wrists limber and pain-free. And that’s a good thing. Was this article helpful? I tried to make the pictures and explanations as clear as possible but sometimes things get lost in translation. Please try these stretches and comment. Thanks! Felt good! Useful stretches for all. Thanks! Really useful tips Nancy and not only for kayaking. My compliments to the model. I had trouble following numbers 3 and 4. Maybe I need a second photo of start and end position of the twist, and a photo of number 3 with fingers upright would be helpful. The text could probably be clarified. When I’m “shaking hands with myself”, which part of my left hand am I gripping? Thanks for the feedback, Krista. 3 and 4 are the most complicated ones if you’re not used to doing them. More photos would probably be a good idea. With regard to #4, you are literally shaking hands with yourself. Try these directions: Start with your elbows bent and your hands in front of you, palms facing in toward your chest (as though holding a small beach ball in your arms against your chest). Your fingers are almost touching. Turn your left thumb down so your left palm is facing away from you. Your right palm is still facing in. Slide your hands toward one another until you are shaking hands with yourself. Your palms are touching and your right thumb wraps over your left pinky while your left thumb wraps over your right forefinger. Now raise your left elbow and drop your right elbow. Using your right hand, twist your left hand in a clockwise direction. Does that help? 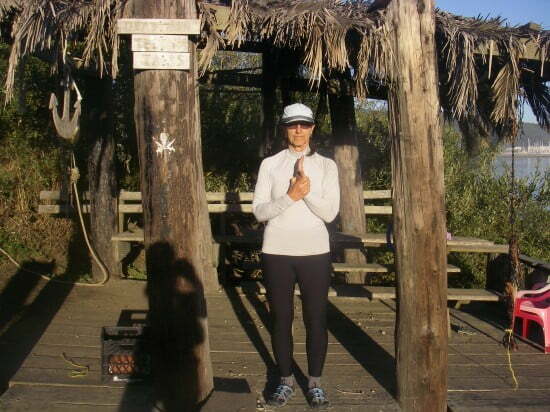 Thanks again for commenting – it’ll help when I put together the next fitness posts. Thank you for this post. It will become part of my regular yoga routine.